Mother of the Tongzhi Emperor, Dowager Empress Cixi was China's de facto ruler for nearly fifty years. Despite a reputation for corruption, Cixi, like other leaders profiled here, desperately wanted to see China returned to its former glory. The Empress Dowager Cixi was the last paramount ruler of the Qing Dynasty. While she governed primarily through the regency, her stranglehold on court power held firm for five decades. Cixi remains a larger-than-life figure, acquiring a reputation for corruption and financial mismanagement (most famously with regards to her “stone boat” in the new Summer Palace) and for rumors of sexual depravity. 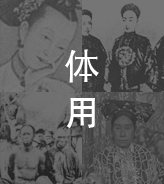 In Wealth and Power, however, Cixi emerges as a more complex character, driven by the same motivations as the other thinkers and leaders profiled in these chapters. Driven by the shame and humiliation of repeated defeats by foreigners, Cixi clearly wanted to return China to its past glory. She sought advice from self-strengtheners like Li Hongzhang and Feng Guifen and turned at times to younger radicals like Liang Qichao. While she failed to rejuvenate China, she did set in motion radical modernizations like the end of the imperial examination system. It took a Dragon Lady to destroy the Dragon Throne...or so the conventional telling of the story would have it. Cixi grew up in Beijing, in a family of Manchurian bureaucrats. She entered the political scene in 1861, when, as a young concubine to the Xianfeng Emperor, she gave birth to a son. When Xianfeng died after the ravaging of the Summer Palace, Cixi’s four-year-old son stood next in line to the throne. The 26-year-old Cixi displayed considerable political smarts, lining up alliances among court officials and maneuvering herself into the position of co-regent with the Emperor’s principal wife. This period of joint rule came to be called the Tongzhi Restoration, as Cixi pressed forward the reform-minded agenda of Li Hongzhang, introducing railroads, steamships, telegraphs and coal mines to China. Cixi stepped down from the regency in favor of her teenage son, the Tongzhi Emperor, in 1873. Cixi retired to other projects, devoting herself to building a sumptuous new Summer Palace to replace the one destroyed by the British. But when her son died suddenly in 1875, Cixi quickly maneuvered to put herself back in charge, putting her two-year-old nephew on the throne as the Guangxu Emperor. Back in the role of regent, Cixi put even more faith in the reforms of Li Hongzhang, but also fell victim to a hawkish streak among Chinese officials. Emboldened by a treaty with Russia that gave China back control over a large area that had been occupied by Russian troops, China sought to avenge their defeat by the French and British in 1860 and recapture another area formerly under their sphere of influence: Vietnam. Once again, however, the French forces easily defeated the Chinese. Soon a larger worry than the Western powers emerged for China: its neighbor to the east, Japan. The contrast was especially vivid between two leaders in the process of modernizing their countries, Li Hongzhang and Itō Hirobumi. China continued to lag behind as Japan leapt ahead. "In about ten years, Japan's wealth and power will be considerable," Li prophesied in 1885. "She is China's future disaster." Li’s words about the Japanese threat turned out to be prophetic. In 1894, Japan went to war with China over control of Korea in the First Sino-Japanese War. By the late 1880s, the Empress Dowager had returned to her goal of rebuilding the Summer Palace, and had diverted important government revenues into the project. The classic, ironic symbol of her wastefulness was her “stone boat,” a marble replica of a paddle steamer that sits today “docked” in the Summer Palace gardens, perhaps slowly paying for itself in tourist dollars. 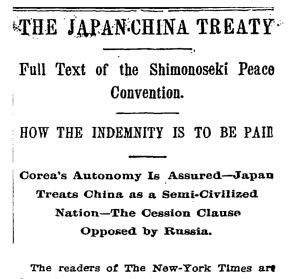 Weakened by corruption, China was beaten by the Japanese and forced to sign yet another unequal treaty. Defeat by the Japanese was particularly devastating. China could no longer use the excuse of Western technological superiority; this was a war fought by two East Asian nations using Western weapons, and China lost to its much smaller neighbor. For further reading, this essay from John Dower includes beautiful woodblock prints of the war. After China’s defeat in Korea, Li Hongzhang traveled to Japan in disgrace to sign another unequal treaty, the Treaty of Shimonoseki, adding to the humiliation China felt after the Treaty of Nanjing and the Treaty of Tianjin. Japan forced China to cede control of the Korean peninsula and also claimed possession of Taiwan. China agreed to pay 230 million silver dollars in indemnities. The sub-headline from The New York Times description of the event says it all: “Japan Treats China as a Semi-Civilized Nation.” Click on the photo to read the full article from the Times. "Why is it that up to now not a single thing has been changed or reformed," Itō asked Li, twenty years his senior, in fluent English...Li plaintively answered through an English interpreter, "My country is hampered by traditions and customs: one can hardly do what one wants." Defeat at the hands of Japan spurred another bout of self-strengthening in China. Guangxu distributed the Dissenting Views of Feng Guifen to his staff, and invited more radical reformers like Kang Youwei and Liang Qichao to the palace. But fearing a loss of their grip on power, Cixi and conservatives quelled Guangxu’s independent streak after only 102 days had passed, before any real reforms could take root. Cracking down on her nephew’s brief reforms, Cixi ordered the executions of reformers like Kang Youwei and Liang Qichao. Kang and Liang escaped to Japan, the first in a line of exiled dissidents. Sun Yat-sen, Chiang Kai-shek, Chen Duxiu, Lu Xun and many other important Chinese reformers would follow in their footsteps, some on the run from the state, others as students, eager to learn from the successful Japanese model and express their dissatisfaction with China’s progress. Following the Hundred Day’s Reforms, peasants in the north of China increasingly began to follow a popular rising political, mystical and martial arts movement known as the Boxer Rebellion. The growing movement, disgruntled at the aftermath of the Sino-Japanese War and the unequal treaties, began to threaten foreigners in northern China. When foreign diplomats in China threatened to have to step in to quell the movement, Cixi fatefully sided with the Boxers. The xenophobic movement, inspired by Cixi’s backing, ran amok, terrorizing Beijing and forcing Cixi and her entourage to flee the capital. For a second time, foreign troops had to march through Beijing, this time to help quell a Chinese uprising. Unfortunately for Cixi and China, repaying the foreigners for their aid required yet another unequal treaty, the Boxer Protocol, demanding a massive indemnity in silver from the Chinese government. This History Channel documentary summarizes the Boxer movement and contains interesting archival footage from the period. Later in life, Cixi attempted to embrace the West and a new series of reforms. She opened the Forbidden City to foreign guests for the first time, expressed a passion for photography, abolished the imperial examinations, and reformed China’s ministries along Western models. She began following Japan’s lead in sending delegations abroad to study constitutional reform. Empress Dowager Cixi used photographic portraiture to rehabilitate her public image. She was fond of posing as the Bodhisattva Guanyin, a Buddhist embodiment of mercy, as seen here. For more pictures of Cixi, read this essay by David Hogge on Cixi’s photographic record. "Whenever I have been angry, or worried over anything, by dressing up as the Goddess of Mercy it helps me to calm myself, and so play the part I represent," she once explained. Cixi passed away in 1908, one day after her nephew, the Guangxu Emperor. Suspicions linger over whether foul play was involved. She was buried in an elaborate mausoleum among other Qing tombs, which she had spent nearly 8 million silver taels preparing. She had held China together for nearly 50 years, and had overseen sweeping systemic changes late in her life, but had left China no better off than she found it. While she certainly pushed for reform throughout her reign, Cixi ultimately proved unable to spur any meaningful progress. She remains best known for corruption, chaos and humiliations suffered at the hands of foreigners.